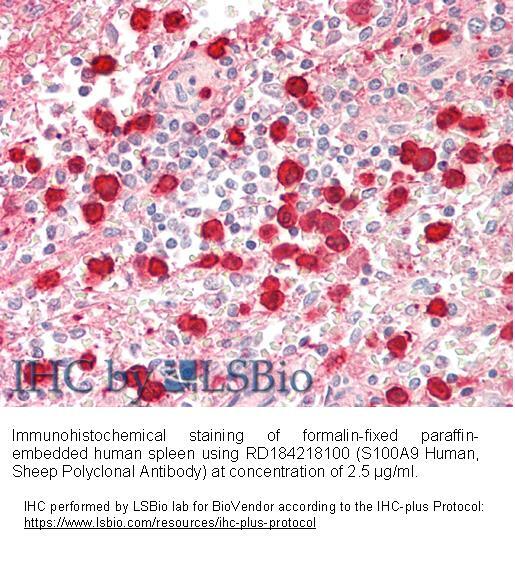 The antibody was raised in sheep by immunization with the recombinant Human S100A9. The immunization antigen (14.35 kDa) is a protein containing 123 AA of recombinant Human S100A9. N-Terminal His-tag, 10 extra AA (highlighted). Immunoaffinity chromatography on a column with immobilized recombinant Human S100A9. S100A9 is a calcium binding protein. Each S100A9 monomer contains a high affinity calcium binding site at the C-terminus and a low-affinity calcium binding site at the N-terminus. S100A9 may exist as a homodimer, heterodimer with an S100A8 partner (S100A8/A9), or as a heterotetramer with an S100A8 partner (S100A8/A9). S100A9 was first identified in the context of multiple inflammatory reactions which has led to confusing nomenclature in the literature. In 1987, it was found in infiltrating macrophages of rheumatoid arthritis patients and named MRP-14 (myeloid related protein of molecular weight 14 kD). S100A9, a the member of the calcium binding S100 protein family that is also known as MRP14 or Calgranulin B, is an inflammation-associated protein that is constitutively expressed in neutrophils and inducible in numerous inflammatory cells, including macrophages, epithelial cells, and keratinocytes. S100A9 is located in myeloid cells, cancer cells, and in tumor stroma. S100A9 is an abundant cytoplasmic protein in normal myeloid cells such as polymorphonuclear cells and monocytes. It has become clear that S100A9 localizes with its partner S100A8 in many biological processes but may act as a sole player in other cancers. S100A8 and S100A9 are minimally expressed in normal esophageal epithelium, but S100A9 is expressed across the spectrum of Barrett’s esophagus through adenocarcinoma. S100A8 and S100A9 belong to a family of 25 homologous low-molecular-weight intracellular calcium-binding proteins that exhibit tissue and cell-specific expression. They are characterized by two distinct EF-hand (helix-loop-helix) calcium-binding domains connected by a hinge region. The N-terminal Ca 2+ binding domain has lower affinity than the canonical C-terminal domain that allows for functionally important second messenger roles dependent on intracellular Ca 2+ levels. These proteins have been associated with chronic inflammatory diseases such as rheumatoid arthritis (RA), cystic fibrosis, Crohns disease, ulcerative colitis, allergic dermatitis, and infection.